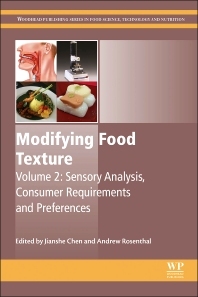 Modifying Food Texture, Volume 2: Sensory Analysis, Consumer Requirements and Preferences explores texture as an important aspect of consumer food acceptance and preference, specifically addressing the food textural needs of infants, the elderly, and dysphagia patients. This volume covers the sensory analysis of texture-modified foods, taking an in-depth look at the product development needs of consumers and exploring the sensory analysis of food texture and the development of texture-modified foods. Dr. Jianshe Chen is a senior lecturer and associate professor in Food Science at the University of Leeds, UK. He is fellow of the Institute of Food Science & Technology (IFST), serving the committee of IFST North England Branch, and the Royal Society of Chemistry Food Group committee. He is editor of the Journal of Texture Studies and a member of editorial board of Food Digestion. He is also a visiting professor to Tianjin University of Science and Technology (China) and China Jiliang University. Prior to his job in Leeds, he had worked as a research scientist in National Starch and Chemical, post-doctoral research fellow in the University of Leeds and the University of Hull (UK), and a lecturer in Zhejiang Gongshang University (China). Andrew Rosenthal started at Coventry University in August 2013 after nearly 25 years at Oxford Brookes University. He is a Food Scientist with research interests in the functional properties of food components and how they contribute to food texture. To this end he has worked on rheological, surface and thermal properties of food materials along with an interest in their sensory properties. As an educationalist he has undertaken pedagogic research arising from a passion for e-learning and the teaching of transferable skills to science undergraduates. Following a HEFCE teaching assessment, Andrew gained FDTL funding to develop what was recognised as good practice in the creation of a Food Video Library – the footage (now on DVD) is available on request for the teaching of food processing operations.